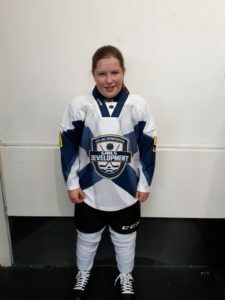 Emma (11) attended her first ever ice hockey match at just 3 YEARS OLD! From that day she knew she wanted to play ice hockey! Emma was a match mascot twice, for the Braehead Clan, now known as the Glasgow Clan during seasons 2014 and 2015. She loves watching the Clan and to this day is a regular supporter at the games. Emma joined North Ayrshire Ice Hockey Club playing with the Ducks and has never looked back. She currently plays in the U12 team, the Penguins whilst also training with U14 team, the Stars and even played within this team on a few occasions. Emma also attends Scotland Girls Development Team and has enjoyed being involved in a lot of games/tournaments. 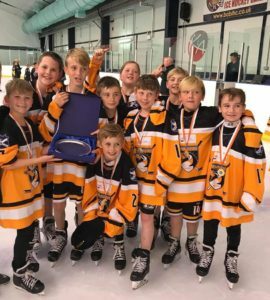 Here’s what Emma has to say: ‘Ice hockey is fun, challenging and an energised team sport. I love watching as well as playing, especially when I see the opposition on the ice – it makes me determined to get out there and beat them! I’ve grown a great relationship with my team members, which really helps when it comes to playing games. Winning and creating good play and scoring goals is our top priority! 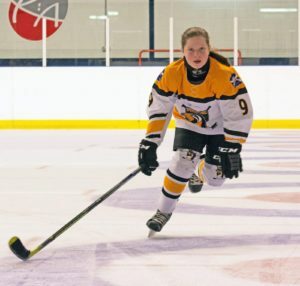 Emma’s dream is to continue to pursue ice hockey and hopes to be the first girl in the NHL. She says, “I will keep my head up and do whatever is my future in ice hockey”.